It was a big day for MMU Archery on Saturday 12th March 2016. Months of prep work led up to us hosting our regional championships, North England University Archery League (NEUAL), at MMU Cheshire. This competition was a UK Record Status shoot, which was very exciting for our team. 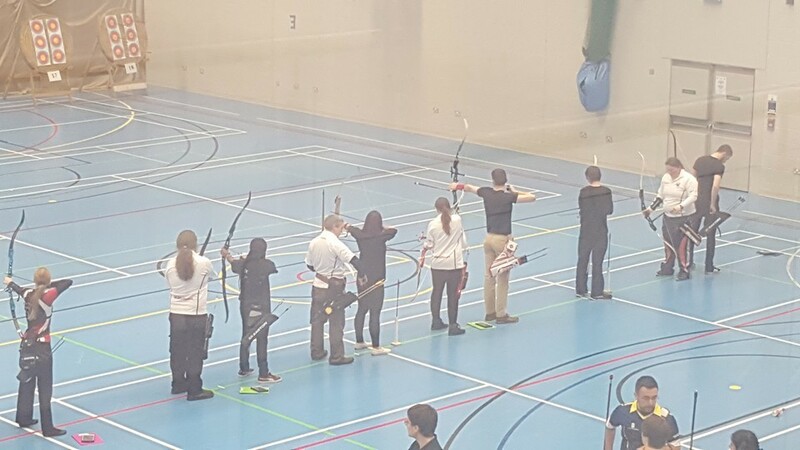 15 teams across North England came to MMU Cheshire Sports Hall to compete in the competition with four judges (archery officials) keeping an eye on all the archers and ensuring the event ran smoothly with the help of MMU and NEUAL. We asked our founder and head judge, Kieran Dexter to be our lord paramount of our competition. How did it feel to be asked to host NEUAL Indoors? What did you do as soon as you found out you were hosting? How did you organise the field party? What did you do for set up and how did you feel it went? What did you do on the morning of competition and how did it go? How did the day go as a whole? The day went like clockwork. Everyone knew where they had to be and what they were doing; we had radios to keep in contact with each other so the event could go as smoothly as possible. The whole event was greatly organised by both MMU and NEUAL in a combined effort. We were able to really showcase our club and our sport. We also brought back a gold medal in men’s longbow to top it all off. So in all, it was a really successful day. How do you think this will progress the club? How does it feel to be the chair of the club that has achieved a successful hosting of a competition? Previous Declan Thompson: “swimming was boring”! Next #BigBUCSWednesday: It’s the last one this season!